Listen, when you're in the market for window and wall solutions in Oklahoma City — you know, designer wallpapers, fabrics, shades, blinds and shutters — you obviously have plenty of options. But if you're looking for a really cool, very hip, very with-it place to spend your decorating dollar, there's really only one choice: Ketch Design Centre on N. Western Avenue. 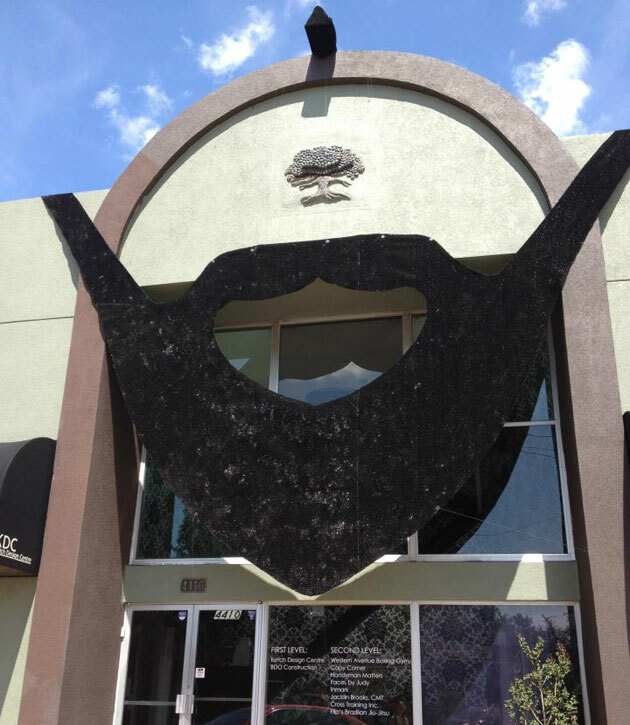 Because, you see, that is the only window/wall coverings vendor that has given itself a giant Mohawk and beard in honor of Oklahoma City Thunder guard James Harden. Now that's a handsome structure. One can only hope that all of the home furnishings on sale within come so hirsutely appointed. The design center spruce-up is just the latest celebration of Harden's dynamic talents and singular, highly recognizable appearance, coming on the heels of bearded cakes, bearded fans, bearded Shaqs, bearded social media presences and a host of other nods. This is the kind of thing that tends to happen when a distinctive look combines with now-routine big-game performances like Harden's dagger-capped fourth quarter in the Thunder's 108-103 Game 5 win over the San Antonio Spurs on Monday night. If he turns in another strong showing in Wednesday's Game 6 to help OKC press past the top-seeded Spurs and into the NBA finals, a building-sized beard won't be big enough. We'll all have to pitch in, band together and fashion a Mohawk and beard large enough to outfit the earth itself. Aliens will need to know that this planet is protected by facial hair so robust and a lefty stroke so sweet that no force formed against it may prosper. Hat-tips to Rob Shahan, CNBC's Darren Rovell and Buzzfeed Sports.